As soon as guests step aboard Seven Seas Explorer they know they have arrived somewhere special. She is the most luxurious cruise ship to ever grace the seven seas and at every turn her designer touches astound, just as her professional crew delights guests by tending to their every need at a ratio of 1 to 1.36. She is intimately spacious, boasting the highest space ratios ever seen in the cruise industry, the largest suite balconies at sea, and the exclusive top-of-the-ship residence with a private in-suite spa, called the Regent Suite among her 375 suites. 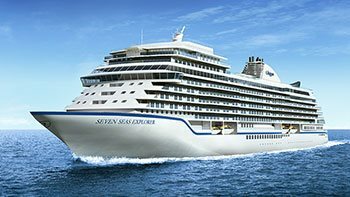 Guests choose from five exquisite dining options, including the exclusive Pan-Asian restaurant Pacific Rim and they may learn to prepare their own masterful meals at the Culinary Arts Kitchen – Regent Seven Seas Cruises' first cooking school at sea. Special promotions available on this sailing! Promotions may include 2-for-1 All-Inclusive Cruise Fares, Additional Savings, Special Kid Fares and More! 2 for 1 All-Inclusive fares are calculated off brochure fares and are reflected in the rates shown on the Pricing and Staterooms tab. *Restrictions apply. Promotions vary by sailing and not all of the above mentioned promotions apply on every sailing. Offers are subject to availability, capacity controlled and may be withdrawn at any time. Savings are reflected in the fares in the Pricing and Staterooms tab. Additional Terms and Conditions for each promotion can be found by clicking on the above link.